The Korean War began June 25, 1950, and lasted just over three years. During that period 33, 686 American troops were killed in combat, and more than 92,000 others were wounded. The war was initially termed a “police action”, for in the beginning it was an undeclared war. Today it is often referred to as “the forgotten war”, a conflict relegated to footnote status between World War II and Vietnam. Yet it was a war, complete with all of the horrors that go along with armed conflicts. Veterans of Korea living in Smithfield will attest to this fact. Bill Gallagher of Greenville was a Private First Class with the U.S. Army 17th Field Artillery Battery. Bill’s path into the Army was ironic. During World War II he was rejected for military service because an Army doctor determined he had a bad heart. October 13, 1951, was a day Bill will never forget. That morning he was digging a trench when his company came under enemy mortar attack. When the first round hit, a red hot piece of shrapnel struck Bill in the left side of his face shattering two teeth and penetrating his sinus cavity. He recalled burning his finger on the piece of metal as he probed the wound to remove it. Bill was the only one wounded during the brief attack and was evacuated to the rear for treatment. Later that same day, more mortars rained down on Bill’s company wounding twelve men. Two were hit in the spine and couldn’t move. As Bill heard it told, Taylor ran out during the barrage and dragged wounded men to the relative safety of the dugouts. 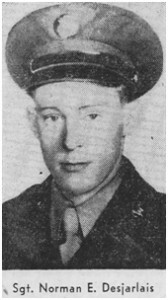 Bill was awarded the Purple Heart for his wound, and later earned the Distinguished Unit Citation, the Korean Service Medal with two bronze stars, the Army Good Conduct Medal, and the National Defense Medal. 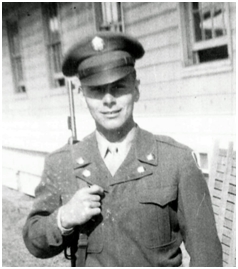 Georgiaville resident Al Piccard was a Corporal assigned to the 226th Ordinance Depot which stored and distributed needed supplies to various commands. Drafted at nineteen, he arrived in Korea in mid 1953. Al related how when he arrived in Japan he was issued new uniforms impregnated with a substance designed to prevent Hemorrhagic Fever, a life threatening bleeding disorder caused by a virus. He was then put on a ship and sent to Inchon, Korea, where he spent four days at a “repple depple”, a military slang term for a replacement depot; a way-station where new recruits would await assignments to replace those who had been killed or wounded. “I never saw any fighting, but we could hear the war from there.” He recalled. From Inchon, Al was sent south to Pusan, where he remained until the Armistice. He was then “loaned” to the Graves Registration Command, and sent into the field to investigate cases of soldiers listed as Missing in Action, (MIA). “We had to see the Provost Marshall to get special passes to go into restricted areas to look for bodies.” Al related. They traveled with interpreters questioning Korean civilians about local skirmishes and possible grave locations. One man in his group was trained to identify racial distinctions between a Korean skeleton and that of an American. Their job took them to remote mountains and deep valleys searching for American remains to bring home. On one occasion, Al’s squad searched for a particular soldier’s remains for over a month only to learn that the man had been taken prisoner. Evidently this information had never been relayed to the Americans. The truth was learned when the missing soldier unexpectedly appeared one day at an American checkpoint after being released during a prisoner exchange in the autumn of 1953. Al earned the Korean Service Medal with bronze star, Presidential Unit Citation – Republic of Korea, United Nations Service Medal, and the National Defense Medal. After the war he returned home and took a job at a textile mill in Greystone. There he met his wife, Italia Grossi, and they shared fifty-two years together. For the families of soldiers back home, a telegram stating that a soldier was “missing in action” could be worse than one announcing an outright death, for it presented a state of uncertainty; was their loved one a prisoner of war, lost, lying unknown in a field hospital, or dead? Such anguish was experienced by the Desjarlais family of Greenville for thirty-nine long months. Norman E. Desjarlais was the youngest son of four boys and two girls. He enlisted in the army in 1948 and became a Sergeant in command of a tank crew. While in Korea he wrote letters home. In one to his mother dated September, 1950, he admitted to having seen action, but implied he was safe in his tank by claiming the enemy shells would bounce off his armored vehicle “like rubber balls”. He ended by telling her he was busy at his job, “so don’t worry if you don’t hear from me for awhile.” This was that last his family ever heard from him. Norman’s older brother, Sergeant Theodore Desjarlais, was also serving in Korea at the time Norman was declared missing. He placed numerous advertisements in Stars and Stripes magazine looking for information, but none ever came. It wasn’t until November 30, 1953, that Norman’s fate was learned. On November 27, 1950, Norman’s tank was hit by an enemy artillery shell during heavy fighting near the Yalu River. Only one crewman, Joseph Wheatly of Texas, survived the blast, and he was taken prisoner. After his release and subsequent repatriation to the Untied States, Wheatly wrote a letter to the Desjarlais family explaining what happened. Several months later the army sent an official telegram confirming Norman’s sacrifice. 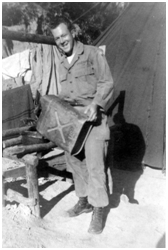 Norman Derosier of Georgiaville was a Corporal assigned to the Red Dragons, a group officially known as the 2nd Chemical Mortar Battalion, the only chemical mortar battalion to serve in the Korean War. Of the 1,007 days the battalion spent in continuous combat, Corporal Derosier saw 637 of them, at times in weather so cold that moisture froze to his face forming frosty sheets of ice. Born in 1930, Norman enlisted in the U. S. Army in December of 1948. Five days before he left for basic training he was introduced to Terry Lagasse and they “clicked” right away. Terry promised to wait for him and pray for his safe return. Norman arrived in Seoul, South Korea, in September of 1950, and was immediately sent north. Just after leaving Seoul his battalion came under enemy attack. While none of his immediate acquaintances were injured, Norman recalled in a recent interview the enemy tracer rounds zipping past them as they dove for cover. Of the nine offensive campaigns launched during the Korean War, Norman served in eight of them. 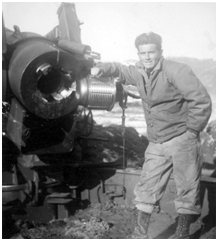 As a first gunner assigned to operate 4.2 mortars, it was Norman’s job to stay behind and provide cover fire for American troops withdrawing from battle areas. The work was risky but important, for Norman recalled how at the Battle of Unsan he stayed at his post for several long hours covering the withdrawal of American forces by using both mortars and automatic weapons fire. He was part of the battalion’s Second Platoon. “Third Platoon was in another area forward of our position’, he recalled, ‘and they were completely wiped out when the enemy advanced.” Norman and a handful of others held their position throwing everything they had at the overwhelming enemy forces before they were finally forced to withdraw when their ammunition ran out. “I just made it out on the very last jeep”, he recalled. Norman wore a religious crucifix around his neck while overseas, and everyday would recite a prayer. He prayed to the Lord constantly, as did Terry for his safe return home. The prayers evidently worked as evidenced by the time an enemy mortar shell landed in the ground right between he and his Lieutenant yet failed to explode. After the war Norman returned home and married Terry. They now have four children, ten grandchildren, and fifteen great-grand children with one more due in December; none of whom would have been born had that mortar round exploded. Today Norman is active with the Korean War Veterans Association, Chapter 3, of Chepachet – a group he helped to establish, and of which he served in as Post Commander. He is also a member of the Smithfield VFW, and worked with other local men to establish the Smithfield Veteran’s War Memorial in Deerfield Park. Among Norman’s numerous awards is the Korea Service Medal with four bronze stars, the Navy Presidential Unit Citation, the South Korea Presidential Unit Citation, and the Presidential Unit Citation. The Korean War officially ended July 27, 1953, however American troops still occupy positions along the border between North and South Korea to protect against possible invasion. In this sense one could argue that even though hostilities have ended, tensions continue, thereby lending credence that perhaps General Patton was right. Filed Under: Articles Tagged With: Al Piccard, Alfred Piccard Smithfield R.I., Bill Gallagher, Bill Gallagher Smithfield R.I., Corporal Al Piccard Georgiaville R.I., Korean War, Norman Derosier, Norman E. Desjarlais, Sgt. Norman E. Desjarlais Smithfield R.I., William Gallagher Smithfield R.I.